Srivasa Pandita is one of the members of the Panca-tattva: sri-krsna-caitanya prabhu-nityananda sri-advaita gadadhara srivasa. Vedic authorities state that in the current Age of Kali, Krishna came as Sri Chaitanya Mahaprabhu and Balarama came as Sri Nityananda Prabhu. Similarly, Maha-vishnu appeared as Advaita Acharya, Srimati Radharani as Gadadhara Pandita, and Narada Muni as Srivasa Pandita. Panca-tattvatmakam: The Panca-tattva comprise one truth on the absolute platform. Lord Chaitanya is bhakta-rupa, Krishna in the form of a devotee. Lord Nityananda is svarupakam, the expansion of a devotee. Advaita Acharya is bhaktavataram, the avatara of a devotee. 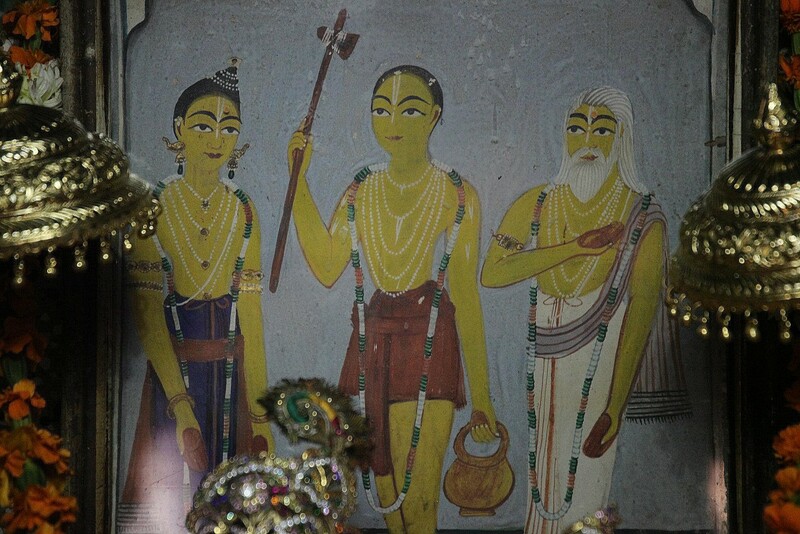 Srivasa Thakura is bhakta, a devotee. And Gadadhara Pandita is bhakta-saktikam, the energy of the Supreme Lord who supplies energy to the devotees—the devotional energy, Srimati Radharani. Rathayatra Pastimes by Lokanath Swami. Sri Caitanya Mahaprabhu spent His later years in Jagannatha Puri, Orissa, immersed in love of Godhead and absorbed in wonderful pastimes with His intimate associates and with the Deity of Krsna in Puri, known as Jagannatha, “the Lord of the universe.” This was nearly five hundred years ago. One of the most attractive of Lord Caitanya’s pastimes was His role in the yearly Rathayatra, the Festival of the Chariots, in which Lord Jagannatha parades through the main street of the city on a huge decorated cart pulled by devotees. Year after year for eighteen years altogether Lord Caitanya took part in the Rathayatra festival in Puri. 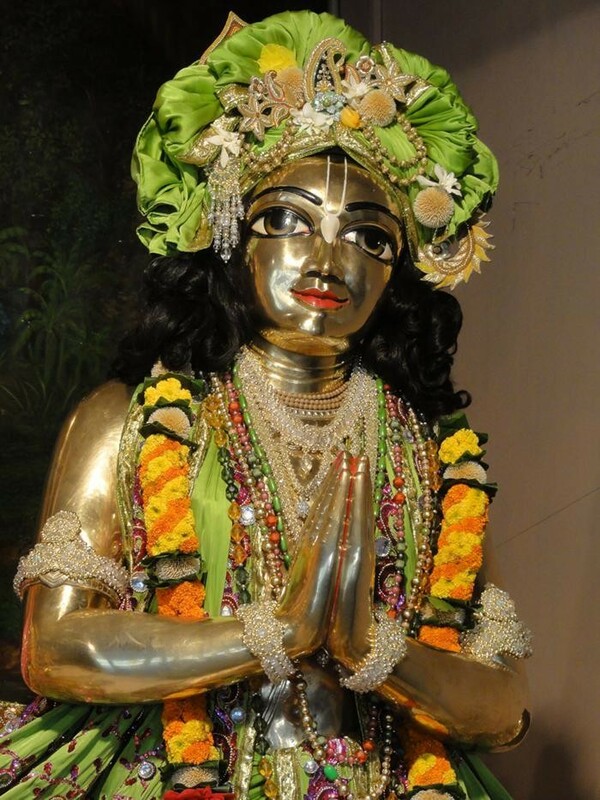 Lord Caitanya Mahaprabhu was Krsna Himself in the mood of Srimati Radharani. So during the festival He used to chant and dance in front of Lord Jagannatha’s cart, acting out a drama. Srila Prabhupada, commenting on the Caitanya-caritamrta,where these pastimes are described, says that the two Lords Lord Caitanya and Lord Jagannatha were reenacting a conjugal pastime, or madhurya-lila. Lord Caitanya, absorbed in transcendental emotions, would play the role of Srimati Radharani, Lord Jagannatha’s eternal consort. Sometimes Lord Caitanya would fall behind Lord Jagannatha’s cart. The cart would then stop as Jagannatha tried to catch sight of Caitanya Mahaprabhu, attracted by His graceful and enchanting dancing. The two Lords were reenacting the pastimes performed five thousand years ago in the holy place of Kuruksetra when Sri Sri Radha and Krsna met after many years of separation. They had last seen each other in Vrndavana, when Akrura had come to take Krsna and Balarama to nearby Mathura. That day had been the worst day for Radharani, the gopis (cowherd girls), and all the Vrajavasis (residents of Vrndavana). As Krsna left, He promised that after killing the demons outside Vrndavana He would return. Krsna, the life of the Vrajavasis, stayed in Mathura for some time and then moved to Dvaraka, where He continued His wondrous pastimes. During these many years, Radha and the Vrajavasis intensely, almost unbearably felt separation from Krsna’s lotus feet. Chaitanya Mahaprabhu was always absorbed in thoughts of Sri Vrindavan, often enquiring in a deep devotional mood, “Where is Vrindavan?” On several occasions, His devotees, fearing separation from Him, diverted, discouraged, or dissuaded Him from visiting Vrindavan. The Lord’s first attempt to go to Vrindavan occurred shortly after He accepted sannyasa, the renounced order, at age twenty-four. Nityananda Prabhu, His chief associate, tricked Him into thinking that the Ganga, which flows through Navadvip, West Bengal, where the Lord lived, was Vrindavan’s river Yamuna. Mahaprabhu was so intensely absorbed in thoughts of Vrindavan that He jumped into the Ganga. But Advaita Acharya, another leading associate, was waiting close by with a boat, and upon seeing Advaita, Mahaprabhu realized that this could not be Vrindavan. Advaita Acharya took Mahaprabhu to nearby Shantipur, where the Lord’s mother, Sacimata, was awaiting His arrival. On her request the Lord proceeded to Jagannatha Puri, to live His renounced life there. From Puri, Chaitanya Mahaprabhu soon traveled to South India, and when He returned, His desire to visit Vrindavan was revived. He decided to first go to Bengal to visit His two mothers – mother Ganga and mother Saci – and the other devotees there. From Bengal He would make His way to Vrindavan.